Two Suzukis. A half‑century ago, in a transplant that has been likened in its historical importance to the Latin translations of Aristotle in the thirteenth century and of Plato in the fifteenth, Daisetz Suzuki brought Zen to the West single‑handed. Fifty years later, Shunryu Suzuki did something almost as important. 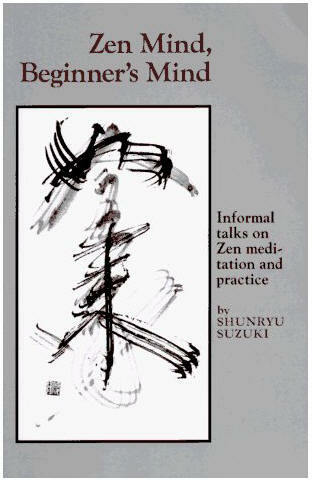 In this his only book, here issued for the first time in paperback, he sounded exactly the follow‑up note Americans interested in Zen need to hear. Whereas Daisetz Suzuki's Zen was dramatic, Shunryu Suzuki's is ordinary. Satori was focal for Daisetz, and it was in large part the fascination of this extraordinary state that made his writings so compelling. In Shunryu Suzuki's book the words satori and kensho, its near‑equivalent, never appear. When, four months before his death, I had the opportunity to ask him why satori didn't figure in his book, his wife leaned toward me and whispered impishly, "It's because he hasn't had it"; whereupon the Roshi batted his fan at her in mock consternation and with finger to his lips hissed, "Shhhh! Don't tell him!" When our laughter had subsided, he said simply, "It's not that satori is unimportant, but it's not the part of Zen that needs to be stressed." Suzuki‑roshi was with us, in America, only twelve years--a single round in the East Asian way of counting years in dozens--but they were enough. 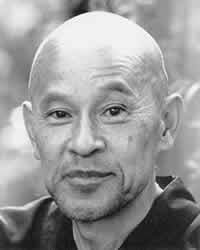 Through the work of this small, quiet man there is now a thriving Soto Zen organization on our continent. His life represented the Soto Way so perfectly that the man and the Way were merged. "His nonego attitude left us no eccentricities to embroider upon. Though he made no waves and left no traces as a personality in the worldly sense, the impress of his footsteps in the invisible world of history lead straight on. "* His monuments are the first Soto Zen monastery in the West, the Zen Mountain Center at Tassajara; its city adjunct, the Zen Center in San Francisco; and, for the public at large, this book. If when I die, the moment I'm dying, if I suffer that is all right, you know; that is suffering Buddha. No confusion in it. Maybe everyone will struggle because of the physical agony or spiritual agony, too. But that is all right, that is not a problem. We should be very grateful to have a limited body . . . like mine, or like yours. If you had a limitless life it would be a real problem for you. The founder of these temples. There is no measure of what you have done. FN*From a tribute by Mary Farkas in Zen Notes, the First Zen Institute of America, January, 1972. There is no easy way to be a teacher or a disciple, although it must be the greatest joy in this life. There is no easy way to come to a land without Buddhism and leave it having brought many disciples, priests, and laymen well along the path and having changed the lives of thousands of persons throughout this country; no easy way to have started and nurtured a monastery, a city community, and practice centers in California and many other places in the United States. But this "no‑easy‑way," this extraordinary accomplishment, rested easily with him, for he gave us from his own true nature, our true nature. He left us as much as any man can leave, everything essential, the mind and heart of Buddha, the practice of Buddha, the teaching and life of Buddha. He is here in each one of us, if we want him.